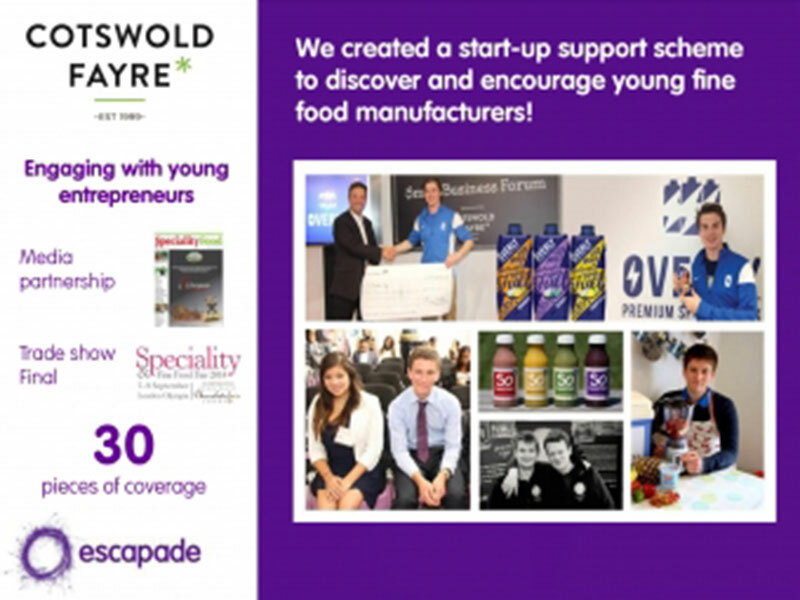 Young entrepreneurs entering the fine food and drink market, to help differentiate Cotswold Fayre from its competitors. We set up a start-up support scheme called Cotswold Collaborates, where the winner would receive £1,000 cash and a year of mentoring from Paul Hargreaves, Managing Director of Cotswold Fayre. A launch release encouraging entrants was compiled and sent to business and start-up media, regional food groups and student publications. Five contestants were shortlisted and invited to present at the semi-final. This was judged by five credible individuals in the fine food industry. We teamed up with Speciality Fine Food Magazine to gain editorial coverage and held the final at the Speciality Fine Food Show. 14 pieces of coverage including; Speciality Food Magazine, Young Academic and the National Student.